Endodontic Care Doesn't Cause Pain — It Relieves It! If you're about to have your first root canal treatment, you might be feeling pretty apprehensive about the whole thing, especially given all the stories floating around. Well, don't worry — all will be revealed in this step-by-step walk-through of root canal treatment. Knowing what will happen ahead of time is more than half the battle; you will soon learn that it really is much ado about nothing. So let's start by dispelling a common myth: Root canal treatment doesn't cause pain — it relieves it! A cross section of a healthy tooth showing a normal pulp (with nerves and blood vessels) and the root canals. 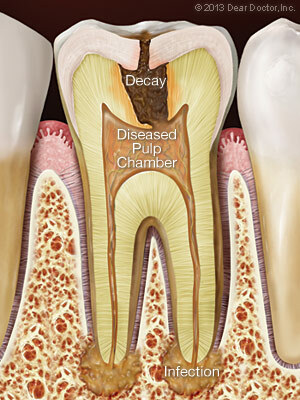 A cross section showing infection from tooth decay spreading into the pulp and bone at the end of the roots. Some background will be helpful. 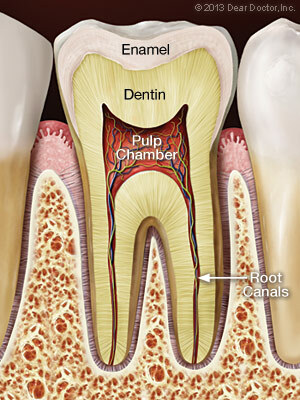 As you will note from the illustrations, a space inside the tooth called the pulp chamber houses the root canal system and pulp — the living tissue that keeps the tooth vital (alive). The pulp includes blood vessels, nerves and connective tissues, and, during childhood, creates the surrounding hard tissues of the tooth. Endodontic treatment (“endo” – inside; “dont” – tooth), commonly known as root canal treatment, is needed when the pulp becomes inflamed or infected. The causes could be deep tooth decay, repeated dental procedures on one tooth (replacing a large filling, for example), or traumatic damage such as a crack, chip or even a root fracture. 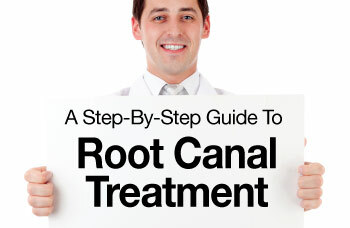 Gum disease can also give rise to root canal problems necessitating root canal treatment. Generally speaking, whatever the cause of root canal or pulpal disease, root canal or endodontic treatment will be necessary to save the tooth. All dentists receive training in endodontic treatment and can perform root canal procedures, but often a general dentist will refer individuals who need endodontic treatment to an endodontist, a root canal specialist. Endodontists are dentists who have completed an additional two or more years of advanced residency training in the diagnosis and management of diseases and disorders of the dental pulp, and in the diagnosis of dental pain; their focus is therefore on saving teeth. In order to make a proper assessment and accurate diagnosis of which tooth is affected and exactly what is causing the pain, a thorough history and examination is necessary, together with a radiographic picture (x-ray) of the tooth or area. Your dentist or endodontist will check your medical history and current medications to ensure your health and treatment safety. If you are very nervous, an oral sedative or anti-anxiety medication may be helpful — discuss the options with your dentist or endodontist ahead of time.